Two things that defined much (maybe too much) of my childhood, Back to the Future and LEGO, may finally come together in one glorious moment of nostalgia. 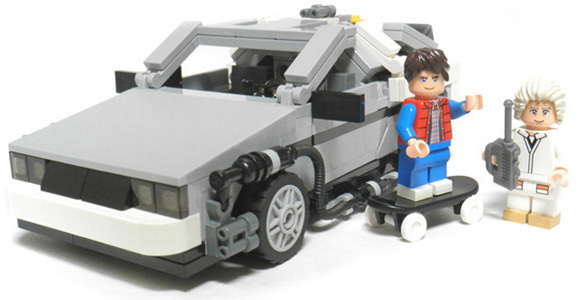 Through LEGO Cuusoo—a website where inventive types can share ideas for new sets, and, with popular support, see their concepts become a reality—a crew has been working on creating a kit that includes the iconic DeLorean time machine along with a little Marty McFly (Michael J. Fox) and Doc Brown (Christopher Lloyd). The whole set up is a bit like Kickstarter for LEGO. With the 30th anniversary of Back to the Future fast approaching (2015), this project is inching closer and closer to becoming real. It just hit the required 10,000 supporter mark, and has moved from a simple “idea” stage to a phase where a “LEGO Jury” reviews the project. A bunch of marketing and design folks will test the idea for playability, safety, and to see if this is true LEGO material or not. The stupidity of Hollywood executives is near legendary. Their tendency to distill complex ideas down to demographics and childish concepts has ruined more than a few potentially great movies. So what must it have been like for a filmmaker like Robert Zemeckis to go around pitching, what must have at the time been a crazy idea, something such as Back to the Future? As a Back to the Future fan it hurts to hear this, but the DeLorean was not a very good car. Produced by the DeLorean Motor Company in part as a means to smuggle drugs, the actual vehicle Doc Brown’s time machine was based on looked awesome but sort of ran like crap. Luckily, they’re getting better. A Houston based company now owns the DeLorean name and they’ve dedicated their time to making and selling new DeLoreans. Don’t worry, they look exactly like the old DeLoreans which means they’re still completely awesome. Last year we learned that they were working on converting their DeLoreans into fully electric vehicles and now… Great Scott, they’ve done it! Harold & Kumar Go To White Castle creators Jon Hurwitz and Hayden Schlossberg just finished work directing the new American Pie sequel American Reunion and, they’ve been so successful that Universal Pictures has given them a two-year development deal. That sounds great, until you hear what they’d like to use that development deal to make. If they had their druthers they’d be remaking Back to the Future. People have been talking about Back to the Future a lot lately, largely thanks to Mattel’s announcement that they’re going to be selling replica hoverboards. Sure, the boards don’t actually hover, because, as Mattel explains with tongue in cheek, that technology won’t be invented until 2015. Still, it’s exactly the sort of objectively useless nostalgia bait that people of my generation love to spend money on, and I have no doubt they’ll sell tons of the damn things. Back to the Future fans let out a collective squeal of glee last month when it was announced that Mattel would be manufacturing real hoverboards…followed by a collective moan of disappointment when it was confirmed that no, Mattel has not actually created antigravity hovering technology just yet. Still, the replica boards are movie accurate and will make a very cool addition to any fan’s collection. Well, any fans that have $120 to drop on the prop, that is. If you’re on the fence about ordering and want to know what exactly you’ll get for your money, check out this behind-the-scenes look at how Mattel is creating their hoverboard replicas.